The scene at an Rover Pipeline spill in Stark County, Ohio. Rover’s impact on Ohio includes the destruction of a historic house, damage to state wetlands and spilling drilling fluid near Canton's main water field. In total, the 710-mile pipeline has racked up 104 "noncompliance incidents." To compare, the second-worst violator was the Virginia Southside Expansion, a 91-mile pipeline that saw 26 incidents. Ohio EPA spokesman James Lee says the pipeline has met most of the state’s orders, except for one that requires them to submit a storm water management permit. Though Lee declined to comment on the Bloomberg report, Ohio EPA officials have been openly critical of Rover’s noncompliance and have recently requested civil action against the pipeline’s parent company, Energy Transfer Partners. 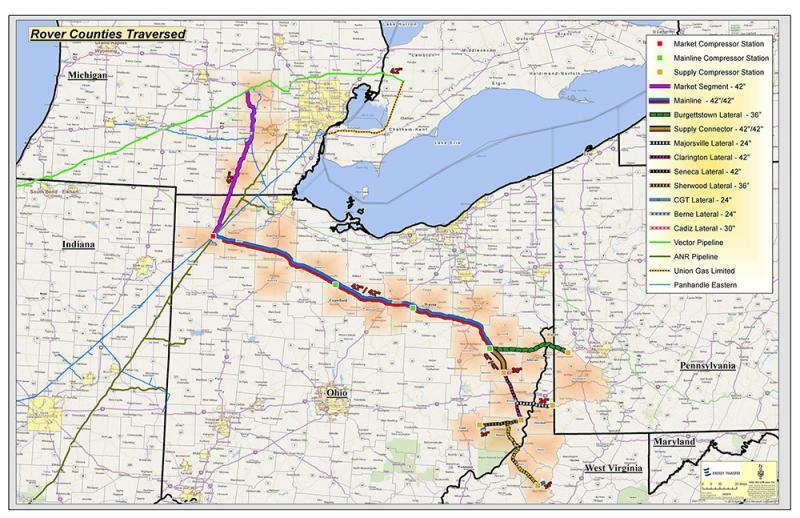 Rover Pipeline's path through Ohio. According to Bloomberg, the Rover Pipeline, which is intended to transport natural gas from the Marcellus shale deposit to the Midwest and Canada, is Energy Transfer's "biggest project since its controversial Dakota Access oil pipeline." The Ohio Environmental Protection Agency is turning to Ohio’s Attorney General to settle its issues with the parent company of the Rover Pipeline project. Builders of the Rover pipeline are going to have to do more testing and may have to pay a bigger penalty linked to the leaking of millions of gallons of drilling mud into a Stark County wetland in April. A federal agency has told a company building a high-pressure natural gas pipeline it cannot resume drilling beneath creeks in southeast Ohio and northern West Virginia. The Federal Energy Regulatory Commission on Thursday rejected Texas-based Energy Transfers' request to resume horizontal drilling. The $4.2 billion Rover Pipeline project will carry gas from Appalachian shale fields across Ohio and to other states. The construction of the Rover pipeline, originating in Western Kentucky, Southeastern Ohio and Southwestern Pennsylvania and spanning across Ohio to Michigan, was halted after spilling more than two million gallons of drilling fluid in the Ohio wetlands. The Rover pipeline is also under fire for refusing to pay $1.5 million to the State Historic Preservation Office in addition to being accused of 18 incidents of pollution violations reported in 11 counties in Ohio. Join us today as we discuss the company behind the construction of the Rover pipeline.